Interior decoration can be defined as "decoration consisting of the layout and furnishings of a livable interior. decor. decoration, ornament, ornamentation - something used to beautify." And then there are our gardens. Just as interior decoration requires a house to contain it, garden decoration would include objects that embellish a landscape with plants. Paving, fences, trellis, and . . . pots. Utilitarian flower pots - the black plastic containers that hold the plants we impulsively fall in love with and bring home from the nursery. Once home and on display in our gardens we want the pots to be beautiful, as well as functional. 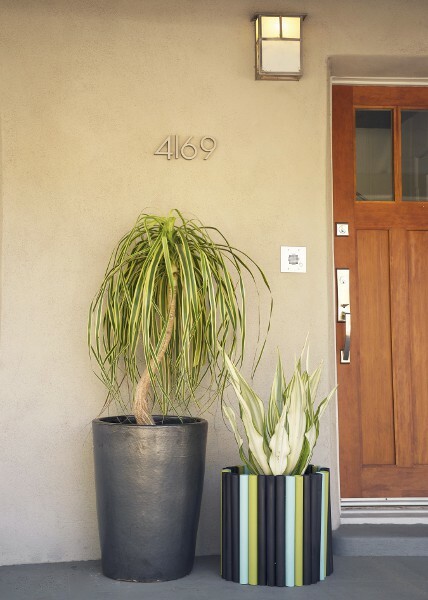 Typically available upmarket flower pots are glazed ceramic in a range of sizes and colors. If not exactly to your taste, there's always the DIY option. If you are hesitant to plunge in, not sure where to start there's a new book on the market with a broad series of options. PVC plastic, terra-cotta flue tiles, metal cans and kitchenware. to create an attractive wraparound pot cover. There's clearly an imaginative mind that looks at concrete blocks, plastic vent covers, plastic trash can and think, "Aha! This could become a unique planter." A galvanized stock tank? How about a water garden. It is not quite as simple as "just add water." Decide where to site it - once filled you water garden will be too heavy to move. Think about how to customize it - here, a warm copper color harmonizes with the terra-cotta hue of the house itself. Sand, tape off, then spray paint. Make sure it will be level before filling with water, then plant. flying saucer planters by these clever ladies. Durable 14-inch diameter stainless steel salad bowls, 3-inch diameter PVC pipe, some sweat equity and voilà - an accent for your garden. 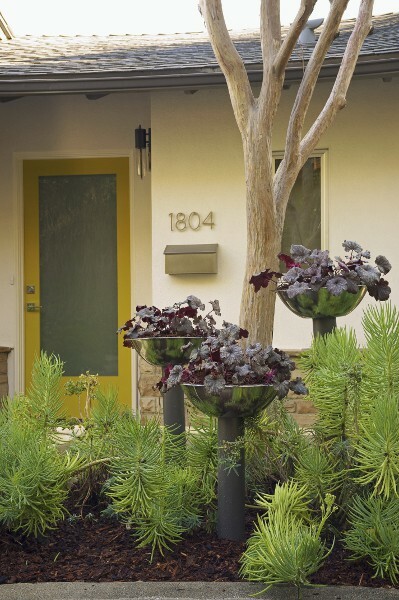 These would be elegant in the garden too, as well as enhancing an entry as shown here. 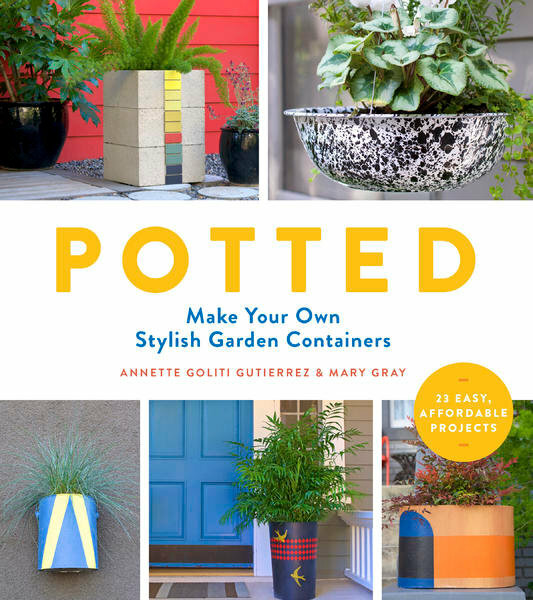 The focus in Potted: Make Your Own Stylish Garden Containers is on creating the various containers, 23 different options and possibilities from a wall of concrete blocks with planting pockets and candle niches to a simple jute rope wrap for a black plastic nursery container. There are minimal suggestions on what to plant, leaving it up to your imagination. 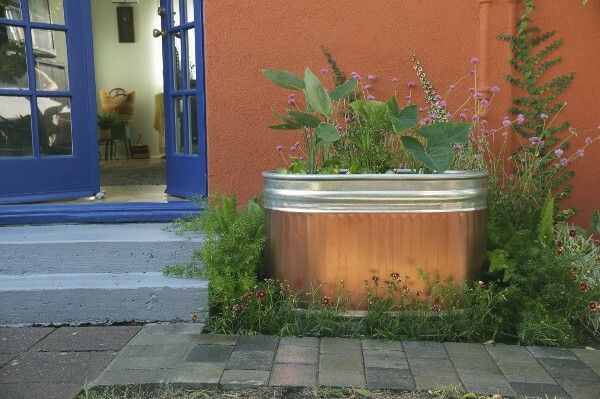 The authors have a garden lifestyle boutique in Los Angeles, so some of the plants in these DIY containers would not be suitable outdoors, year-round, for regions with cold winter weather. A gardener will always choose plants that appeal to them, just as they might prefer other colors for the PVC pipe wrap pot cover.